The fast growing weeping willow is native to China and cultivated in Japan, but now grows all over the world to heights of 70 feet, thriving near rivers and streams. The Weeping Willow gets its name from the way the branches droop downward from the crown of the tree. 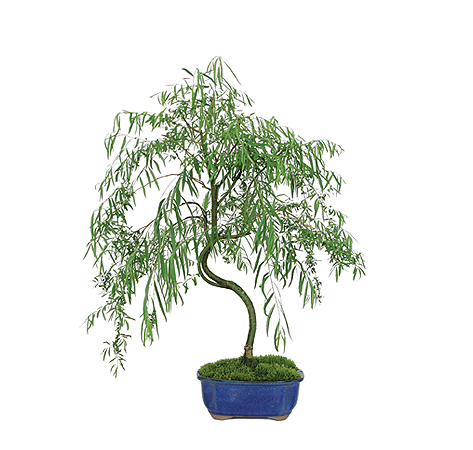 Very hearty and easy to grow, the Japanese Weeping Willow promises to be a beautiful showpiece for any bonsai lover from beginner to master. The exceedingly rare 'Rokakudai' Weeping Willow is a graceful bonsai that features lush, wispy, green foliage and slender curving branches atop a substantial trunk. The Japanese Weeping Willow sheds its leaves during winter months allowing its gracefully rounded and drooping branches to be fully appreciated. This is an outdoor, deciduous bonsai, and will do best if allowed a dormant period. During the growing months, you should only bring it indoors for short periods in order to keep it healthy. Keep an eye on your bonsai tree to ensure that it is well protected from extreme temps throughout the winter. A cold frame or shed will go a long way to provide adequate protection as long as the roots have been insulated well. In the late fall, the leaves will fall off your weeping willow, the trunk will turn brown and the tree will go dormant. Don't panic if your tree looks dead during the cold winter months. While it may look bad above ground, under the soil the roots will continue to grow, and in the spring, your tree will flourish once more. Carefully consider where to locate your weeping willow bonsai outdoors. Due to the fact that its roots are contained, you don’t have to worry about its natural tendency to clog up water pipes or sewers, but you must take into account that it desires full sun, and can only tolerate mild shade. In areas that experience extreme heat, the weeping willow bonsai must be placed in a well-shaded area and must be provided with adequate water during extended dry spells. Trees that have received too much or too little water will have droopy leaves. A tree with the right amount of water will have crisp, healthy looking leaves. Weeping willows are slightly drought tolerant, though you should never allow it to completely dry out as it does best in moist, cool conditions; its native habitat is usually near ponds, streams, and lakes where cool, moist conditions are the rule rather than the exception. That being said, it is also possible to over water your willow, causing the roots to rot, and the plant to decline. Take care to not allow your Weeping willow an extended waiting period in standing water. This can be achieved with the use of a humidity try filled with stones which will offer healthy levels of moisture for the roots without risking the health of your tree. Pruning this bonsai each season will promote lots of healthy growth the following year. Remember that weeping willow wood is not particularly strong and is not suited to wiring; a free flowing form is the nature of the willow, and it presents best in this fashion. Common pests to weeping willows are caterpillars, scales, and aphids. To deal with aphids, a simple mixture of 1 tsp dish soap to 1 quart warm water sprayed over the entire plant until desired runoff is achieved is very effective at removing this pest. Be sure to rinse the solution well with tepid water and repeat as needed. Scale can be removed manually with a sharp knife or dabbed with a swab or ball of cotton dipped in isopropyl (rubbing) alcohol. Do not use other alcohols, such as ethanol or methanol, because they penetrate the plant tissues rapidly and will cause considerable damage to soft tissues! After treatment, be sure to remove all scales by hand, large and small; allow the plant to dry and re-examine it for residual scale bodies. Repeat the alcohol wipe to remove all traces of the insects paying particular attention to the midrib, other veins, and leaf edge areas. Keep in mind that scale eggs are hidden under the waxy covering of the dead female, so if these are not thoroughly removed, the remaining eggs will hatch and continue the infestation cycle. Be sure to repeat treatment every 1-2 weeks until scale has been completely eradicated. Please be aware that a potentially rare problem that can occur with alcohol treatment is chilling of the plant tissues that can occur with the rapid evaporation of alcohol. This chilling is can cause over-cooling of the plant tissues, creating zones of dead cells that may become necrotic from bacteria or fungi. On warm or breezy days consider wiping any residual alcohol with a tissue instead of permitting it to evaporate off the plant. Willows root readily from soft cuttings place in loose moist soil. They are prolific rooters, and it should take little time to establish a good root system from a cutting. To ensure proper cell growth of your beautiful Japanese Weeping Willow, it is important to keep the delicate leaves free from dust which can impede proper photosynthesis needed for the trees health and wellbeing. Proper care will ensure decades of enjoyment with your willow.